You want to know how a free-to-play iPhone game keeps a guy that barely has time to play new releases engrossed for more than 365 days? I have one day left to breed a Solstice dragon, and three days to breed a Sapphire. Curse you, Dragonvale. I first wrote about Backflip Studios' Dragonvale in December of last year, after realizing I had been playing it for months and never got around to writing about it. I stopped briefly between last January and March. When I came back I discovered that I had missed my chance to breed the Leap Year Dragon — a chance that wouldn't come again for four years. I vowed never again to miss a limited time dragon. 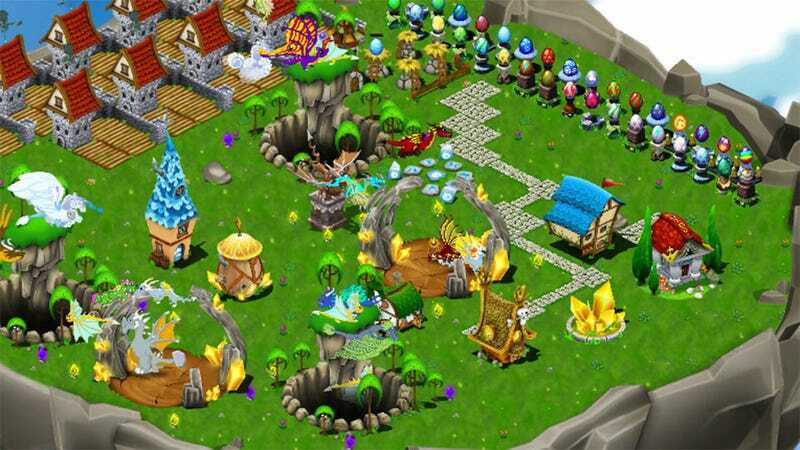 Dragonvale, as you may have surmised, is a game about raising and breeding dragons. You build habitats based on the various dragon elements, hatch dragon eggs, grow food to raise their levels and then start mixing and matching within the romantic confines of the breeding cave. Habitats generate gold, which can be used to buy more habitats, eggs, and decorations to make your various islands prettier. Folks without an iPhone or iPad can play the copycat Dragon City on Facebook for a similar experience. It's that desperation to not miss a single specimen that keeps me playing, and undoubtedly drives the game's in-app purchases. By buying gems (you can earn them slowly without paying as well), players can bypass the often punishingly random breeding process and secure rare spawns with little effort. The rarest of dragons are incredibly expensive. The most expensive in the market currently, the Rainbow Dragon, runs 2,500 gems. 1,500 gems costs $49.99 in real money. A few months back a Backflip Studios rep gifted me some 16,000 gems. I have a little under 300 left. I've also missed the thrill of breeding deadlines. Now I'm broke once more, and I've got hours left to earn the Solstice dragon. Backflip recently introduced Gemstone Dragons, a series of 12 creatures that correspond to the birthstones of the months of the year. I've collected four so far, but only have three days to get September's Sapphire Dragon. If I miss it, I wait a year to try again. I cannot let that happen.